Quick: Get the values you want within just few tabs – no more spending time finding a number in a distribution table. Easy-to-Use: No coding. No learning curve. Intuitive. Input what you have and StatsMate will tell you the values you want. Light: No more carrying that huge textbook just for tables in the back. Accurate: StatsMate uses well-established methods and algorithms recognized by statisticians such as Applied Statistics routines. Affordable: Just $1.99 (or equivalent). Students: Spend less time on calculating so students can spend more time learning actual concepts, materials, and applications. Teachers: StatsMate HD has a VGA-Out support so teachers can visualize statistical calculation on an HDTV or a projector easily. Researchers: StatsMate is accurate enough for a preliminary statical analysis. Use StatsMate to save your time in a field or in a meeting. Businesses: Show your clients statistical results on-the-fly without unpleasant codes, tables, or calculations. 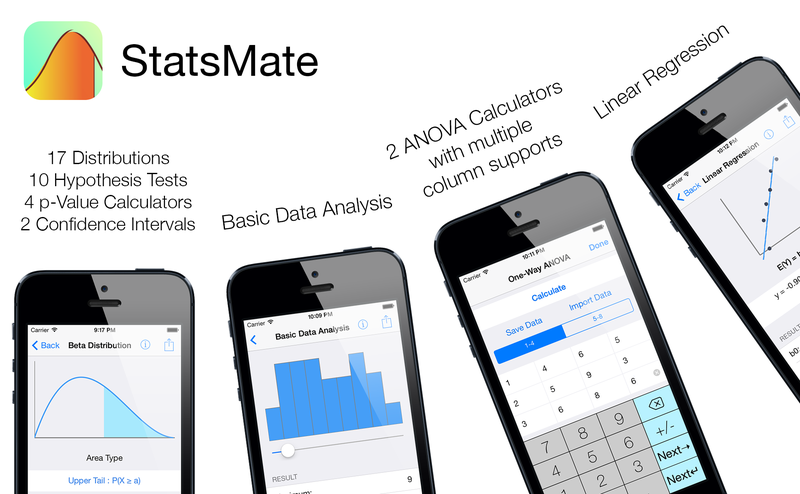 Everyone: A quick, easy, accurate and affordable way for anyone who needs to calculate statistical values. 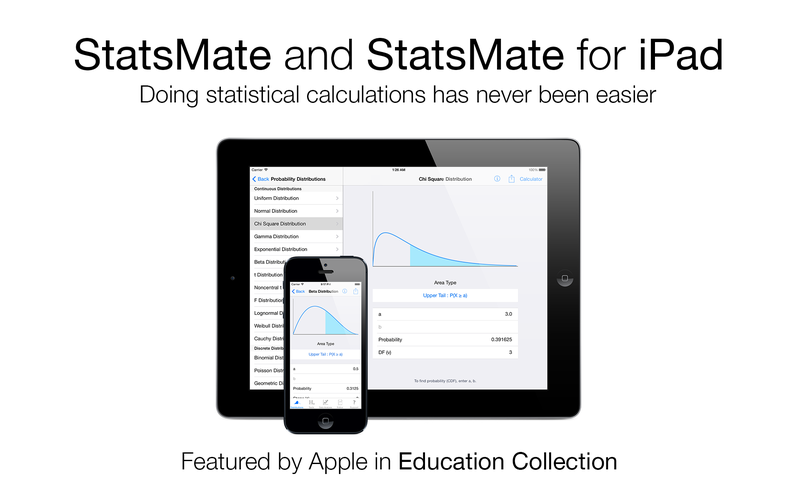 StatsMate and StatsMate for iPad are available exclusively on the App Store. 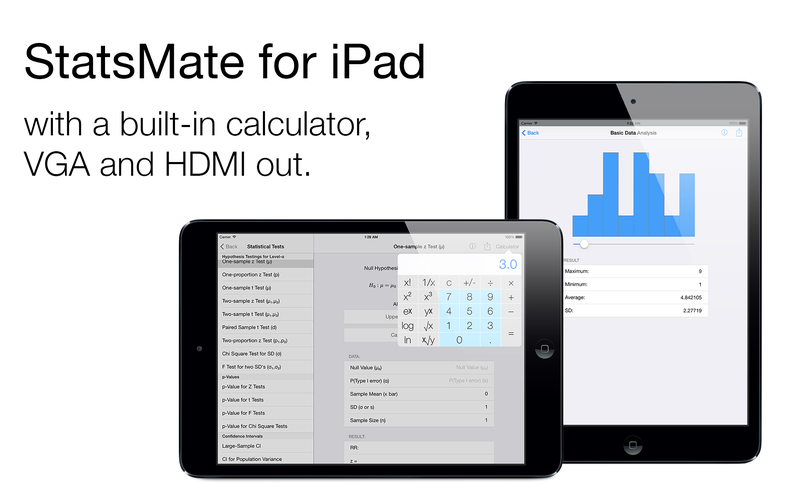 StatsMate and StatsMate for iPad requires iOS 7.0 or later. StatsMate and StatsMate for iPad are available half-priced for educational institutions through Volume Purchase Program. You can export datasets created by StatsMate as a PDF file, a Microsoft Excel spreadsheet, a CSV file, or a text file. 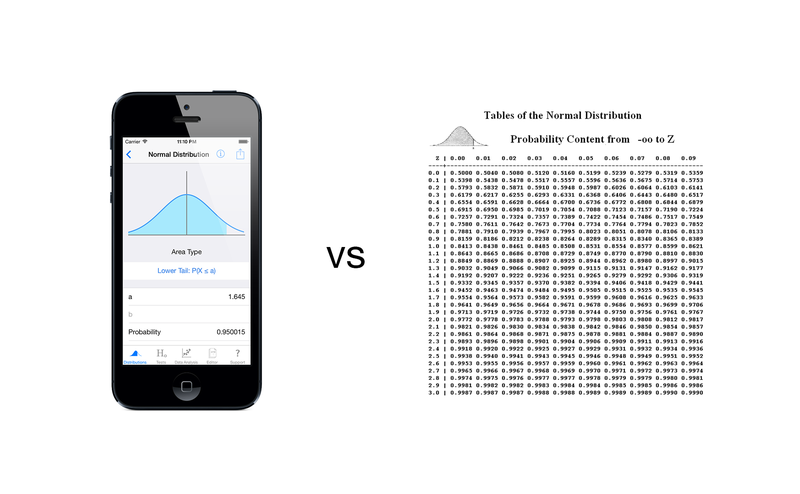 You can export calculation and analysis results via AirPrint, email, message, or open in other apps. 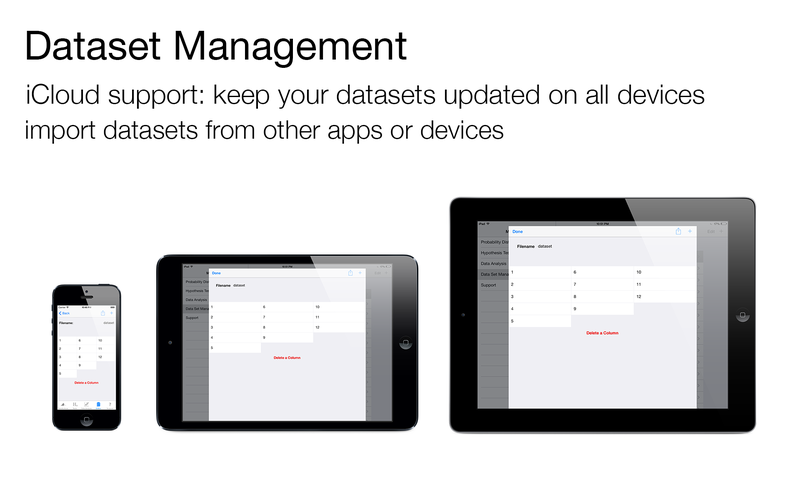 You can manage, save, and import datasets created on other apps or devices. You can store your datasets locally or on the iCloud. Supported document types are Microsoft Excel spreadsheet, CSV, plain text, and rich text. Please email for support, bug report, feature request, or any other questions.